Immediately separated from Viola and imprisoned, Todd is forced to learn the ways of the Mayor’s new order. But what secrets are hiding just outside of town? And where is Viola? Is she even alive? And who are the mysterious Answer? So it’s been a little over a year since I read The Knife of Never Letting Go, the first book in the Chaos Walking series. Having loved that book, it would have made sense if I immediately dived into the second one, especially since I had a copy. But here’s the thing I realized with the Patrick Ness books I’ve read so far: they’re all pretty emotional, the kind that makes you need some time and space in between his books to prepare yourself for another ride. Especially if you’re one who gets a bit attached to the characters, like me. Spoilers for the first book inevitable at this point forward. And so now that a year has passed, I pick up The Ask and the Answer. The book picks up almost immediately where Knife left off: Todd wakes up and finds himself tied to a chair facing Mayor Prentiss, now President Prentiss, questioning him. Todd had only one concern in mind — where Viola was, and if she’s still alive, especially since he remembered carrying her almost-lifeless body towards what they thought was Haven. The “haven” that they expected is now New Prentisstown, with the Mayor as the new leader. But it seemed like the Mayor doesn’t want Todd dead. He spares his life, teams him up with his son Davy to do some work in New Prentisstown, promising Todd that Viola will live if he follows the rules. The Mayor suddenly doesn’t seem to be the person Todd believed he was…but can he be trusted? In the other side of town, Viola wakes up, far from dead. She meets Mistress Coyle, one the best healers in Haven, and Viola finds out that the Mayor has locked all women in for reasons yet unknown. As Viola recovers, she becomes an apprentice healer, constantly worried about Todd and if he has survived whatever the Mayor had in store for them. But soon, Viola finds out that there’s more to Mistress Coyle than being a normal and best healer in New Prentisstown — and she needs Viola on her side. Then the bombs start exploding. 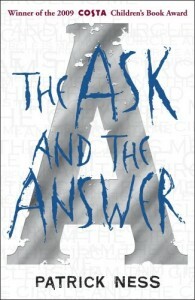 The Ask and the Answer picks up the pace from the first book, dropping us straight into the conflict. Todd and Viola’s separation tears at them both, and while they don’t really know what to do or who to trust, they know they have to be with each other, no matter what. They both grow up lots in this installment, with all the politics and manipulation and desperation going on around them. This is also far darker than its predecessor, tackling themes such as torture, genocide and terrorism to name a few. This book had the same vibe I got from Mockingjay, with the violence unleashed in the pages…and this isn’t even war yet! 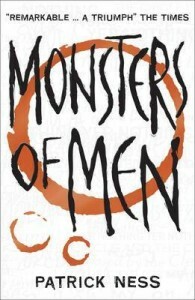 It makes me wonder if the second book is as intense as I found the third Hunger Games book was, what more of Monsters of Men? I can’t imagine how dark that would be now. This book blurs lines between the good and the bad guys, and truly, it’s hard to pick a side in the entire story. Should the end justify the means? Is terrorism the only way to achieve “peace”? Gray areas abound and the moral issues were tackled with the same detail as in Knife, but not too deep that it’s not so hard to understand. As if that’s not enough, Ness brings in another player into the field by the end of the novel, which I should have expected but took me by surprise. My favorite character in this installment isn’t Todd or Viola, though, but Davy Prentiss. Davy, who only wanted to make his dad proud. Davy, who acts like a tough man but who’s really a boy. I loved how the relationship between Todd and Davy was developed, especially since I hardly saw it coming. It was easy to dismiss Davy as a villain especially after he shot Viola in the first book, but his evolution was a definite surprise. I am impressed at how Ness made him into a character that would earn the sympathy of the readers in the end. When Aaron tweeted about this book novella, I squealed inside the office. No joke. I immediately called my friend Jana from her workstation, who squealed too, and once again with me, when we found out it was free. This book was one of the reasons we disrupted the peace and quiet at the office that Friday afternoon. 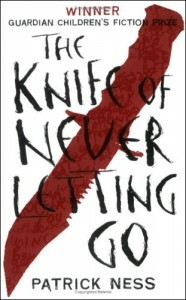 It’s no secret that I loved Patrick Ness’ The Knife of Never Letting Go, and I was really looking forward to reading the next two books in the trilogy, especially since Monsters of Men came out in paperback last week. Although I haven’t read the second and third books yet, my friends have told me so much about it that I know I would probably like it as well. When you like a book/series this much and you haven’t even read it all yet, any companion novel is bound to make you excited. At least, that’s how I see it. 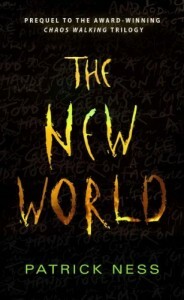 The New World is a 23-page novella that tells us how Viola landed in the New World (aka Todd’s world) and glimpses of her life before she reached the planet. Here, we meet her parents, as well as some of her friends and we get to know about her, most especially her survival skills. The prose is sharp and the action flows smoothly through flashbacks and the present time. It’s not as raw or awkward as Todd’s point of view was, but I think Viola’s voice was very accurate to how I knew her from the first book.